I’m trying out a new photo sharing service called Photrade (>>coverage on TechCrunch). The twist is that you get paid when your photos are shared by other people. You can also make money by selling photo-related products such as prints, T-shirts, mugs, etc. Below is an example of one of my photos with an embedded ad. 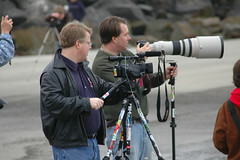 I had a great time on Photowalking 8 with Thomas Hawk and Robert Scoble. Below is some video that I took towards the beginning of the photowalk. Check ScobleShow for the full video, coming soon. My photos are here and there are lots more great photos here.